Frank was born in Karlsruhe, Germany on 23rd May, 1900, to lawyer Karl Frank and his wife Magdalena Buchmaier. He had an elder brother, Karl Jr., and a younger sister by the name of Elisabeth. He joined the German army in 1917. He served in the Freikorps and joined the German Worker's Party (which soon evolved into NSDAP), in 1919, being one of the party's earliest members took part in the Beer Hall Putsch. He went on to study law, passing the final state examination in 1926, and rose to become the personal legal advisor to Hitler. When Hitler became Chancellor in 1933 he appointed Frank as Minister of Justice in Bavaria. While in this post he complained about the illegal killings that was taking place in the concentration camp at Dachau. 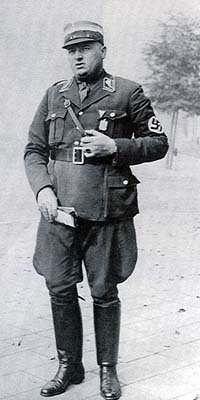 During the Night of the Long Knives Frank raised objections to the execution of the proposed execution without trial of 110 members of the Sturm Abteilung (SA). As as result of his intervention only 20 men were shot. After this Frank lost his influence in the NSDAP hierarchy. Strongly influenced by the charisma of Hitler, he returned to the Party in 1928 whereupon he formed the "National Socialist Jurist Association" with himself as leader. 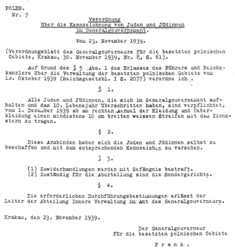 In 1929 Hitler appointed him director of the headquarters legal department of the Nazi Party. He won an election to the Reichstag (German parliament) as a National Socialist representative in 1930 and shared his experience with Friedrich Krüger who entered the Reichstag in 1932. In 1930, Hilter entrusted Frank to research his ancestry in order to dispell rumors that Hitler had Jewish blood. "Frank undertook this delicate task, and he declared in the autobiography written in his cell at Nuremberg that what he discovered made it appear possible, if not likely, that Hitler's father had been half Jewish. The main facts are clear enough. Hitler's grandmother, a Fraulein Maria Anna Schicklgruber, worked as a cook for a well-to-do Jewish family named Frankenberger. The Frankenbergers had a son who was nineteen years old at the time Hitler's forty-two-year-old grandmother bore a child out of wedlock, and the Jewish family paid for the support of the child up to the time it was fourteen years old. Frank wrote that the money was given to avoid a public scandal. Apparently, although Frank does not say so, Fraeulein Schicklgruber had threatened to bring a suit against the Frankenbergers. Frank wrote that many letters were subsequently exchanged between them and Hitler's grandmother, which seemed to him to be evidence of a cordial relationship. Nevertheless, both he and Hitler were convinced that the child was actually the offspring of a millworker, Johann Georg Hiedler, a second cousin of Fraeulein Schicklgruber, who five years after the birth of the child married her and legitimized her son. But Frank, writing in Nuremberg no longer for the benefit of the Fuehrer, was also of the opinion that it was not out of the question that Hitler's father, who later changed his name from Hiedler to Hitler, was half Jewish." In 1931 Hitler showered more accolades upon him by designating him as a Reichsleiter (high Party official). By 1933, when the National Socialists came to power, Frank was a leading protagonist of the New Order by being appointed Bavarian Minister of Justice, Reich Commissioner and reformer of the Nazi state legal system. In 1934, he aspired to Reichsminister without portfolio, the high point of his political career as from then on, others Himmler, Göring, Goebbels et al. ), were ally vying for Hitler’s personal recognition and favours. Frank was never subservient when it came to the interpretation of the law and because of this, he had many fallings out over the draconian measures being introduced. In 1939, because of Frank’s legal contribution to the Führerstaat, Hitler made him president of the German Academy of Law. In September of that same year Frank was assigned as Chief of Administration to Gerd von Rundstedt in the General Government. From October 26, 1939, following the invasion of Poland, Frank was the Governor-General of the General Government for the occupied Polish territories (Generalgouverneur für die besetzten polnischen Gebiete), that is head of the General Government controlling those areas of Poland that had not been directly incorporated into Germany (roughly 90,000 km² out of the 170,000 km² Germany had gained). He was granted the SS rank of Obergruppenführer and also tasked to oversee the segregation of the Jews into ghettos (Jewish quarters) and the use of Polish civilians as "forced and compulsory" Labour. "...A problem that occupies us in particular is the Jews. This merry little people (Voelklein), which wallows in dirt, and filth, has been gathered together by us in ghettos and [special] quarters and will probably not remain in the Government-General for very long." "We will get these Jews marching and cause them – as they have already covered the distance from Jerusalem to Poland – to move eastward a few thousand kilometers. But these Jews are not that parasite gang alone, from our point of view, but strangely enough – we only realized it over there [in Poland] – there is another category of Jews, something one would never have thought possible. There are laboring Jews over there who work in transport, in building, in factories, and others are skilled workers such as tailors, shoemakers, etc. We have put together Jewish workshops with the help of these skilled Jewish workers, in which goods will be made which will greatly ease the position of German production, in exchange for the supply of foodstuffs and whatever else the Jews need urgently for their existence. These Jews may well be left to work in this way; in the way in which we are now using them it is something of an achievement for the work-Jews themselves; but for the other Jews we must provide suitable arrangements. It is always dangerous, after all, to leave one’s native land. Since the Jews moved away from Jerusalem there has been nothing for them except an existence as parasites: that has now come to an end. If one looks at the Warsaw ghetto today in which 480,000 Jews – well, let us say – live, then one must realize that only the determination of the National-Socialist revolution was capable of successfully confronting even this problem. In 1919, at our first meetings in Munich, we proclaimed the motto: An end must be put to the rule of the Jews in Europe...."
Later in life Frank was to refer to his time as Governor-General of Poland as 'the most terrible years' of his life and repeatedly pointed out that, contrary to appearances, he was 'an isolated, powerless man who had no influence on events'. 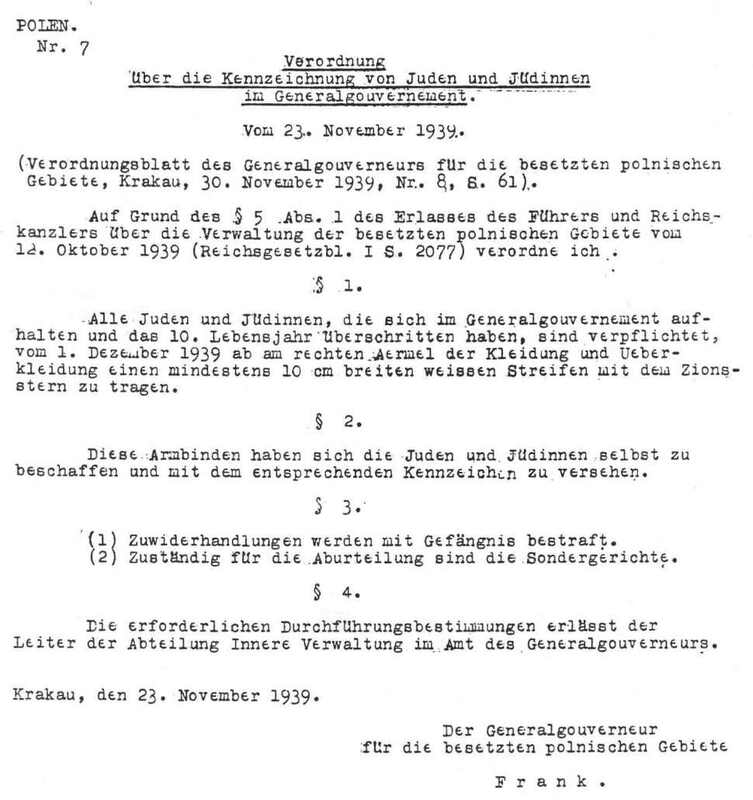 In fact, from the very day of his appointment his jurisdiction was eroded from all sides, and it casts a revealing light on the disloyal duplicity of Hitler's policies towards his followers that from the outset he failed to give Frank any support in his struggle for authority, in particular support against the bid for autonomy by SS Obergruppenfuhrer Kruger, who was in overall control of the SS and the police in Poland. 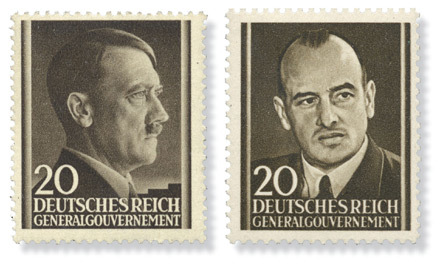 Hitler actually fostered the rival independent authority, though Kruger was formally subordinate to the Governor-General. The system of half-jurisdictions that were combined into total jurisdiction only at the summit, in the person of Hitler as the final arbiter— a system which we can observe throughout the Third Reich— subsequently resulted in a total disorganization that was quite obviously accepted as a necessary price to pay; it was also made the pretext for continual exhausting conflicts in which Frank, a man at the mercy of uncontrollable emotion, proved hopelessly inferior to the cold intriguer Kruger. 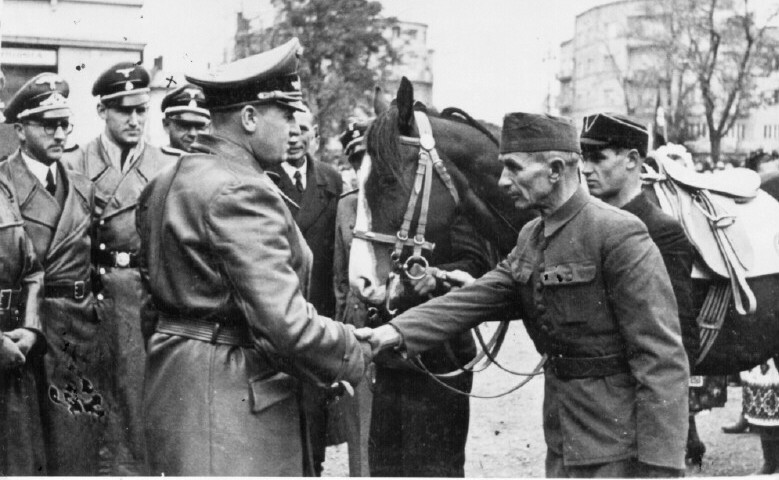 While Frank, obviously in increasing desperation, invoked his exclusive competence to give orders at sittings of the government, Kruger, under Himmler's protection, simply went ahead with his, or at least the SS's, conception of a policy for Poland. Frank tried alternately to counteract this policy by one of relative leniency and reason towards the Poles, with occasional rudimentary attempts at cooperation, or to outdo the SS by even greater harshness, hoping by acts of terror and mass extermination to gain a reputation with Hitler and his entourage for National Socialist ability in dealing with the East. "I can tell you a graphic difference. In Prague, for example, big red posters were put up on which could be read that seven Czechs had been shot today. I said to myself: If I put up a poster for every seven Poles shot, the forests of Poland would not be sufficient to manufacture the paper for such posters." 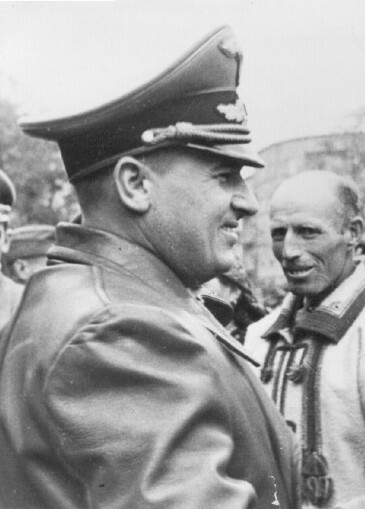 Frank was captured by American troops on May 3, 1945, at Tegernsee near Berchtesgaden. Upon his capture, he attempted suicide in which he tried to cut his own throat. After the attempt failed he tried suicide again on 5 May, when he lacerated his left arm. However, this failed too. 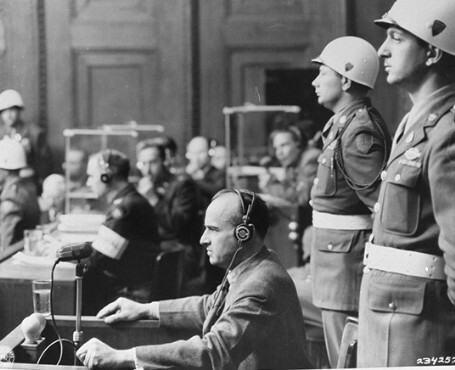 After his arrest he was selected as one of the defendants in the Trial of the Major War Criminals before the International Military Tribunal in Nuremberg from 20 November 1945 to 1 October 1946. During the trial he renewed his childhood practice of Catholicism and, under the pressure of being on trial for his life, claimed to have a series of religious experiences. "A thousand years will pass and the guilt of Germany will still not have been erased." 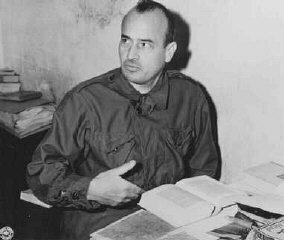 However, during the trial, he vacillated wildly between penitence for his crimes and blaming the Allies, especially the Soviets, for an equal share of wartime atrocities. 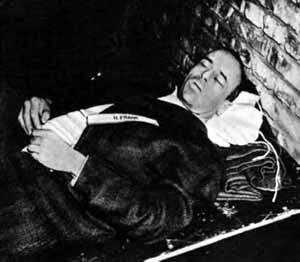 He was found guilty of war crimes and crimes against humanity, and on October 1, 1946, he was sentenced to death by hanging. Speech at Berlin University, Work Diary of Hans Frank, Yad Vashem Archives, JM/21. Rosenbaum, R, Explaining Hitler: The Search for the Origins of his Evil, Macmillan, 1998.